Recipe kindly provided by Chef Donna Crivello of Donna's Café in Baltimore, Maryland. For Dill Dijon Mayonnaise: Mix mayonnaise, mustard, fresh dill and lemon juice. Cover and chill in refrigerator. For Turkey Burgers: Place all ingredients in a medium sized bowl and mix lightly to incorporate all ingredients. Shape into 6 ounces patties, about 1-inch thick. Oil grill rack and preheat grill to medium-high. Add burgers to hot grill and cook on one side for about 5 minutes, flip and cook on the other side for about 4 minutes more on medium-high. Transfer to a cooler part of the grill and continue to cook a bit longer, until cooked to 165°F (73.8°C), about 5 more minutes. For Assembly: Spread Dill Dijon Mayonnaise on lightly toasted rolls. 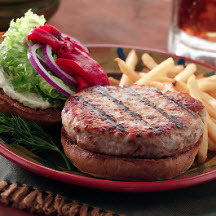 Place turkey burgers on rolls and garnish each burger with lettuce, onions and roasted red peppers.